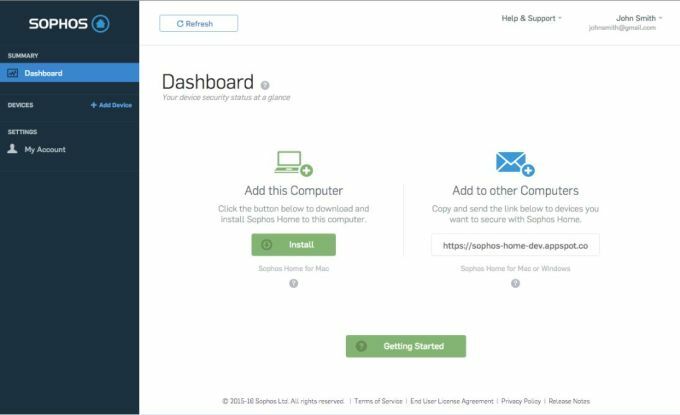 Sophos Home is a free program designed to protect every PC and Mac in your personal cyberspace, or in your family, from threats like malware, viruses, ransomware, malicious software, and compromised or unsuitable websites. Sophos Home utilizes the universally acclaimed and accepted technology deployed by security professionals in protecting the information systems of various organizations. 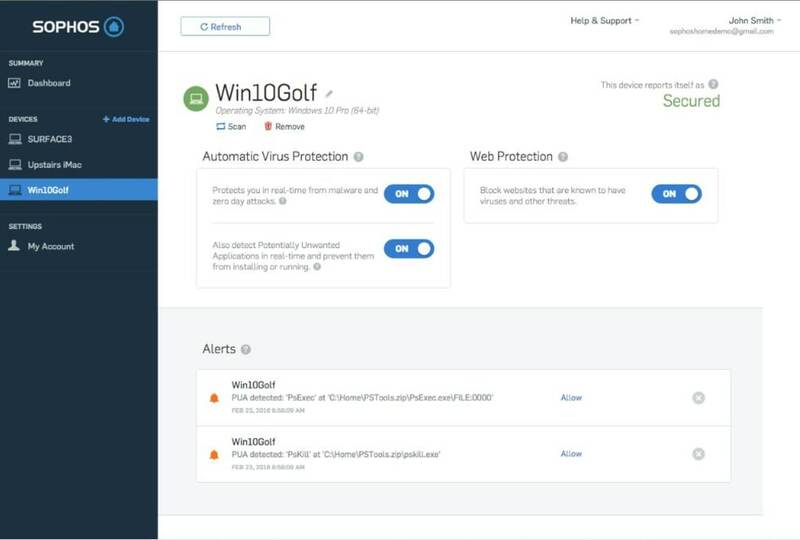 The icing on the cake with Sophos Home is that users can customize their security settings for each computer from any of the popular browsers, like Chrome, Edge, Firefox, and Safari. Sophos Home is for non-commercial and domestic use for up to 10 computers per account. Not a home user? Sophos has a full range of business and enterprise solutions that can be tried for free for your organization at Sophos.com. 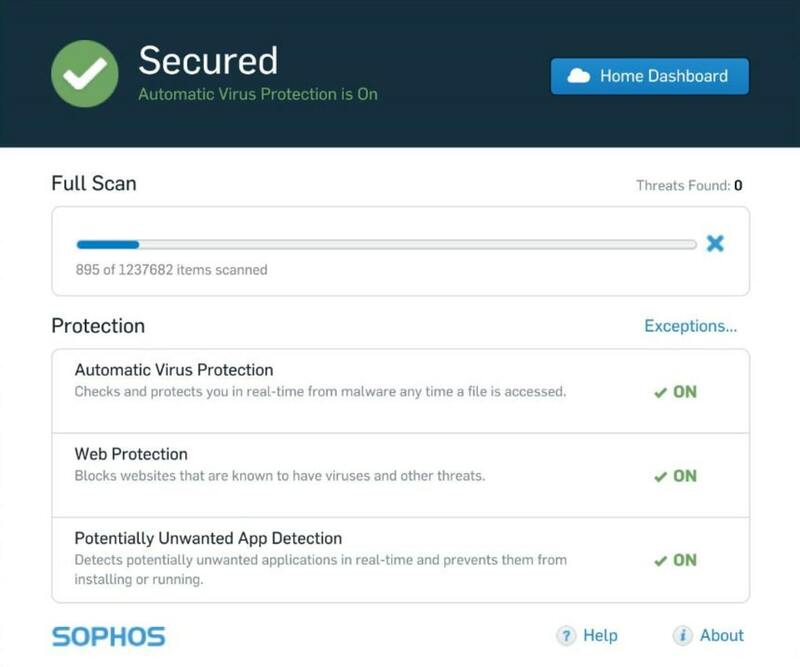 Sophos Home repels dangerous viruses and prevents malware from affecting machines’ performance or files. It serves as a bulwark against hackers, phishers, and credit card fraudsters, preventing access to users’ personal data and information. 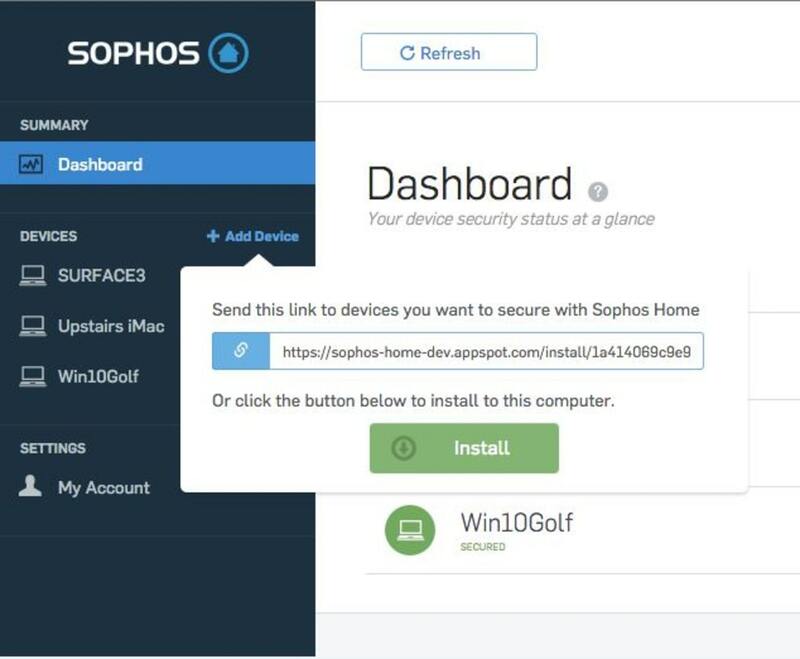 Sophos Home prevents users from accessing bad or compromised sites, while allowing parents to filter what type of websites their kids can access. Sophos Home is compatible with Mac OS X 10.8 and higher, as well as Windows 7 and higher. It has an extremely simple and user-friendly process of managing security from a web dashboard. The dashboard features an in-depth troubleshooting help guide and FAQ to help users find their way around the program. 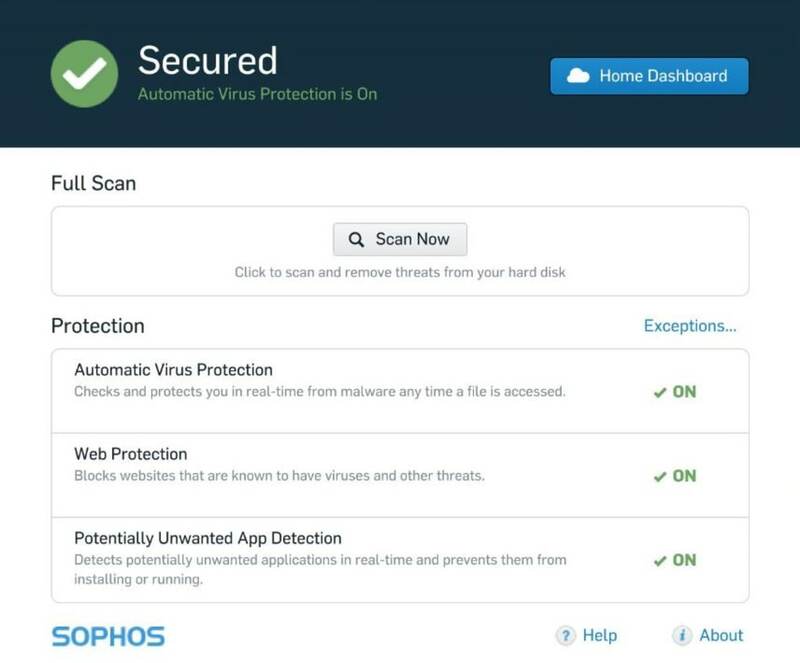 Sophos Home’s main dashboard consolidates everything the user needs to know about their security settings. 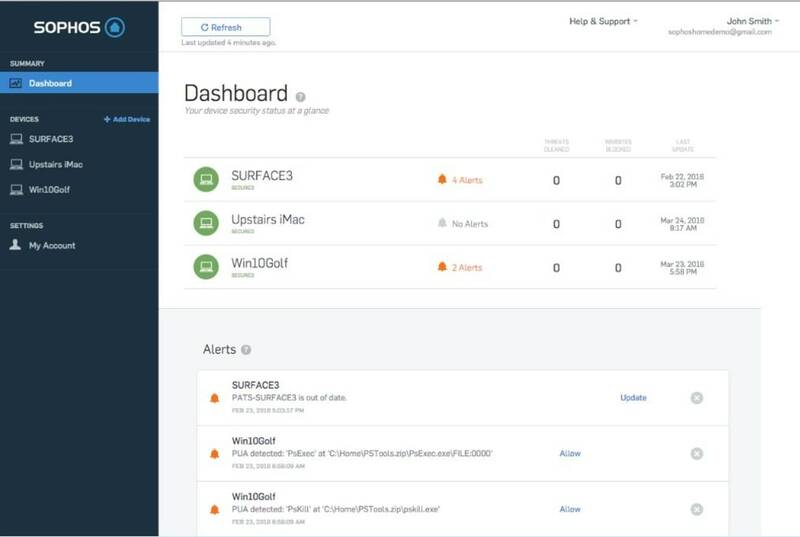 Users can quickly see security status updates and alerts tied to each computer. They can also add additional computers to protect. With a click of a mouse, users can select each machine individually for additional management features. Users can request scans or remove the device. Each device page allows users to turn off/on the three different overall security settings, specifically Automatic Virus Protection, Potentially Unwanted App Detection, and Web Protection. It also features security status updates, alerts, web filtering options, and an exceptions feature. As stated above, Sophos uses the same award winning enterprise technologies in Sophos Home. It has earned praise from a host of independent testing labs. If you are looking for an antivirus program that is both free and effective, then Sophos Home is not only able to meet, but exceed the standards of its competitors. Its simplicity, reliability, and versatility are more than able to meet the needs of the modern online user. 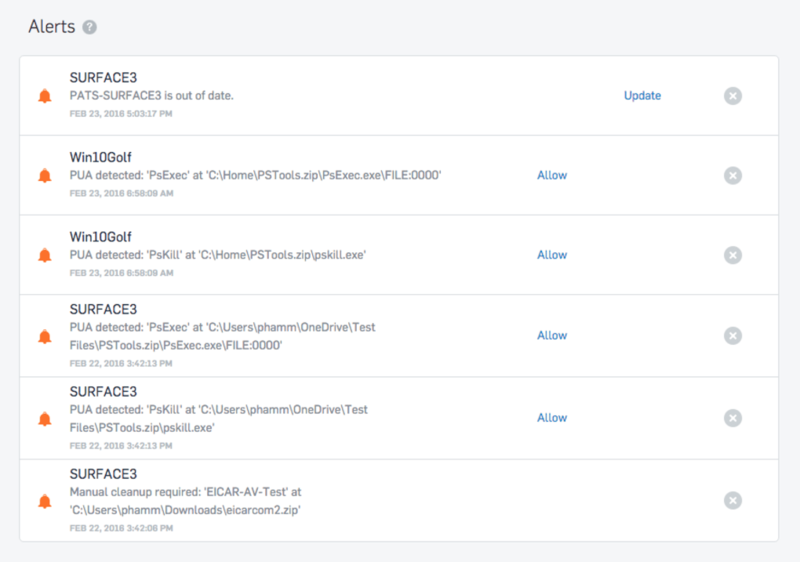 Sophos Home protects with both signature based and signature-less/behavioral-based (zero day) detection including on-demand malware scan, on-access malware scan, malicious URL blocking, phishing protection, and potentially unwanted app detection. Users of Sophos Home can easily manage security settings for computers located anywhere from any web browser. Add computers in seconds, manage policies, and perform scans on any computer under management. The management tools are tamper resistant with auto-logout and password protection. Sophos Home protects users from online threats and unsuitable content. Users can block access to sites that may contain inappropriate content or malicious software. Unlike other AV solutions on the market, Sophos Home allows you to manage the security of 10 personal computers from anywhere in true simplicity. It's no-nonsense security with the performance of enterprise/business solutions. It also includes customizable parental web filters, normally unheard of with free solutions. All the protection you need, without useless add-ons. And there are no ads, pop-ups, or prompts to enter credit card information. What do you think about Sophos Home? Do you recommend it? Why?